The larvae of this species feed on a wide range of trees and shrubs such as Bombax ceiba, Brachychiton spp., Celtis spp., and Millettia pinnata. Mature larvae 26 mm long, body brown with narrow dark brown bands and some yellow spots; head pale brown with horns. 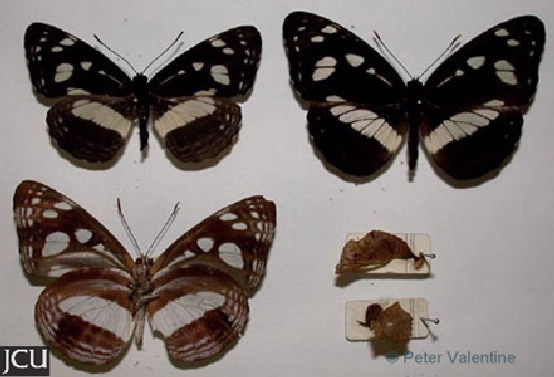 Upper surface of adult is black with white markings and a tinge of green, hind wing has a central white band crossed by dark veins; lower surface brown with purple tinge and white spots and bands.